There has not been much apparently said about the fishing for pipe within the blowout preventer (BOP) at the Deepwater well today. The project seemed to come to a studious pause with the discovery of a considerable volume of hydrates around the shear valves in the Deepwater BOP, as opposed to the lesser quantities of hydrates in the 3-ram stack that was placed on top of the well, as part of the shut-in procedure. The interlocking crystals appear to be filling the empty spaces just above the rams in the BOP, and holding the pipes in that space with sufficient tenacity to make them difficult to remove. If that is indeed the case, and the crystal growth extends down through the BOP and into the spaces at the top of the well then it poses a potentially significant problem to the extraction of the drill pipe, and the removal of the existing BOP. The current BOP needs to be replaced so that a functional BOP can be placed in its stead, and the well can be conventionally plugged and sealed and then abandoned. However, if the hydrates have extended down through the mechanism and space of the BOP, then, as with the upper set of rams, the moving parts of the BOP may no longer be functional, meaning that the drill pipe cannot be released. This then raises a further complication, since if the drill pipe continues to extend below the BOP (and it is believed to extend some 3,000 ft) it too may be held within a hydrate plug that fills the space between it and the steel and cement rings that form the upper lining of the well. I will probably explain how we use that principle in bolts that hold the mine roof up around the world that are often called full-column resin anchors, in a Sunday tech talk fairly soon, but the net result is that the BOP and drill pipe may be locked in place. 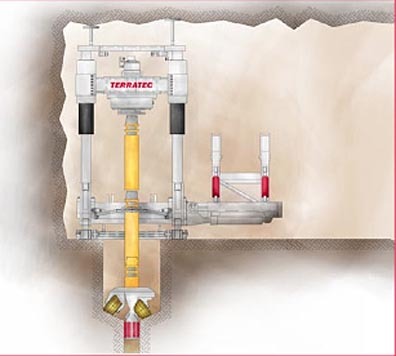 This makes the next step in the process somewhat difficult to predict, since the intent in removing the BOP was both to allow the well to be plugged, but also to provide a backup protection for the top of the well, at the time that the relief well drilled into the lower part of the well, and where the changing pressure condition at the bottom of the well might cause the seals at the top of the well to rupture and, with inadequate protection at the bottom of the well potentially allow the well to start leaking again. While this consequence is somewhat unlikely, it depends on the condition in pieces of the well that are not available for inspection. Hydrates above the shear ram suggests that it is likely that they extend below the rams, but there is no way of knowing without clearing the passage. And the extent, or even the possibility of the drill pipe being held within a plug of hydrates is not that much different to it being held in a cement collar that adhered as the cement was pumped to the bottom of the well. 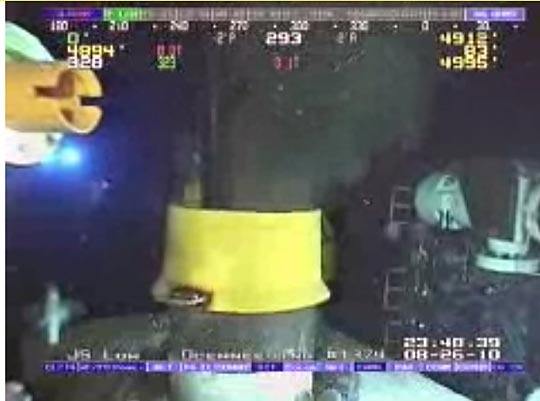 The hydrates above the ram could be removed (either with the high-pressure jetting or chemical/thermal soaking) but it may be more difficult to get through the BOP to release the underlying catch holding it within the sea-floor mount, and to release the drill pipe, or even to section the drill pipe to release the assembly. And just before midnight (as I did a last check after writing this post) they started flushing the BOP with some fluid. Moving down to Chile, the machine that will be used to drill the relief well is a variant on a raise drilling machine, that is used more commonly for boring holes upwards from the underground space, rather than reaming them down. 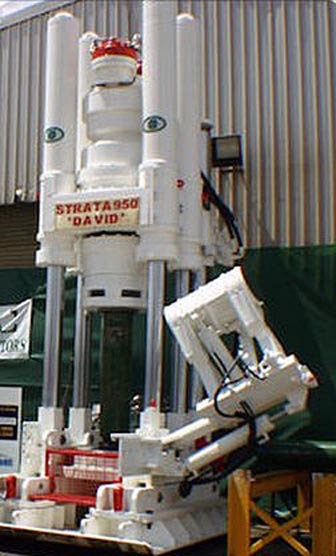 It is a Strata 950, made by Murray and Roberts through RUC Cementation. The unit, was, apparently, only built last year. 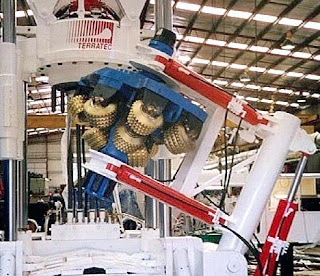 RUC Cementation has established the capability to design and manufacture specialist large diameter raise borers in its Kalgoorlie workshop. During the year (2009), three Strata 950 raise borers (the most powerful underground raise drill rig in the world) were completed, one for its own use and the other two for group operations in South Africa, Canada and Chile. Raise borers normally work by drilling a small hole (13-inch diameter) down from the surface to an existing underground space. Then a reaming head is attached to the drill steel at the bottom of the hole, and the head rotated and pulled back up the hole, allowing the debris to fall into the larger hole below it. It is a relatively fast and effective method of creating shafts, and is increasingly used at the surface and in underground mining. Normal use of a raise borer . In some cases, such as the present one in Chile, it is not possible to get the larger reaming head down to the bottom of the shaft. In that case, once the initial central bore has been completed, then a second reaming head is mounted and will drill down along the same line, with the debris still falling down the central hole, and being disposed of underground. In contrast to up-reaming the drill shaft is in compression which might help on longer bores. One of the drilling requirements is to watch the torque that develops in the drill rods, since this can build-up to sufficient levels that, if suddenly released (as in drilling broken rock) it can whip the head around sufficiently fast as to break the string. The actual teeth on the bit are specially designed for the rock that the bit will be expected to penetrate, but they are conventionally bit or button teeth, similar in shape to those used in the smaller cones of a conventional oilwell bit. Reaming head being loaded into place. The drill will operate from a concrete pad, which is, I gather, now poured, but must set before operations can commence tomorrow, and the hole is not planned to be lined, which may also cause problems, since there is no easy way to deal with rock that falls behind the head. However this particular one is called “David” so let us hope it can meet all challenges. I do have a couple of other concerns. One is that the miners were apparently getting water from an underground stream, and one worries as to whether this water leaves the mine though an existing natural channel, or if it has been flowing to the bottom of the mine, where it might have been earlier collected and pumped out. If the sump pump no longer has power, this could imply that the mine is slowly flooding. And in that regard, the decision not to send power down into the mine, means that they could not send down and power small pumps that the miners could then use to keep their current location dry.